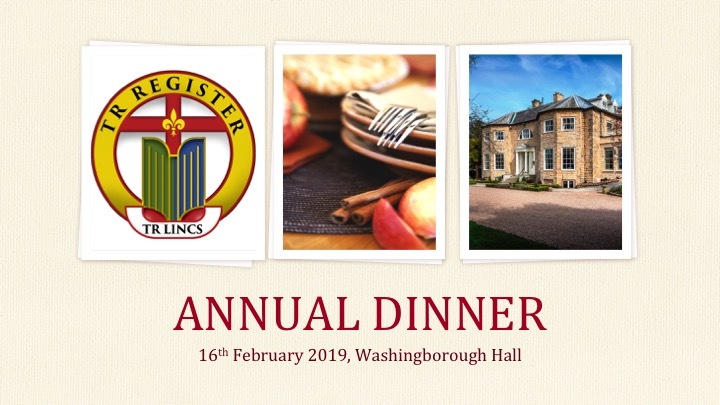 By popular demand our Annual Dinner for 2019 will be held at the wonderful Washingborough Hall, near Lincoln. Those of you that attended in 2018 will know how special a place this is and how wonderful the food was. You will be even more thrilled to learn that I have managed to keep the costs the same as last year. Even more of a reason to attend is that the chef, Mark Cheseldine, was crowned Chef of the Year at the Taste of Excellence Food & Drink Awards. Costs are £33 per person for a 3 course dinner followed by tea/coffee and homemade fudge. For those who would wish to stay over then I have secured a reduced rate of £110 for Double Bed and Breakfast accommodation and have reserved 6 rooms for our use, but these will only be held until January 2019. If you would like to book a room then please contact Washingborough Hall direct and quote the TR Lincs event to secure your reservation with a £10 deposit/person payable at time of booking. Our menu selection for the evening can be found by clicking this link Lawton-TR-Lincs-16th-February-2019.pdf. If you would like to attend the dinner then please contact me via TRLincs@yahoo.co.uk where I will send you further details and how to pay your £10 deposit per person. This year was a great success, let's make next year's even better.